As a little girl, I used to roam the streets of Waikiki and always had an affinity towards the homeless. I would give away my lunch money to the man living on the corner of our street. For whatever reason, I just felt this pull and enjoyed having conversations with him. Our conversations felt meaningful, real, and I always walked away with a heightened sense of self-awareness. I was about 8 years-old. There’s something very special about connecting with those who live outside the realm and expectations of our functioning society. And I still feel this way today. Sometime in my early college years, I picked up the camera and decided I wanted to do a story on the homeless in Waikiki. I wanted to revisit the streets from my younger years. I woke up early one Saturday morning, and rode my bicycle down to the shoreline with no real plan. It would be a little adventure, a roll of the dice to see what life would throw at me. I met a veteran named Gerry that morning, who had been serenading the sunrise with his guitar. He had long silver hair, and kept a collection of trinkets tied to the neck of his guitar. He called them his “lucky treasures.” We sat, we sang, watched the sunrise, and shared life stories (his were far more interesting than mine). He became deeply emotional talking about his mother, his upbringing, and the sense of loss with regards to his daughter. I could not help but think about my own relationship with the father I did not know. That day, I walked away feeling like maybe the universe wanted me to share this moment with Gerry because we both needed it and would grow from it. Fast forward a few years and I was spending my summer before law school at Ala Moana Beach Park, getting to know the guys who lived under the shade of enormous trees nicknamed “The Forest.” I met an incredibly intelligent artist/writer named Darryl, who was full of thought-provoking ideas. He spent most of his days at the public library pouring over the most recent national and local headlines. We had intense debates and discourse on the homeless condition, and the trajectory of our society and political world. 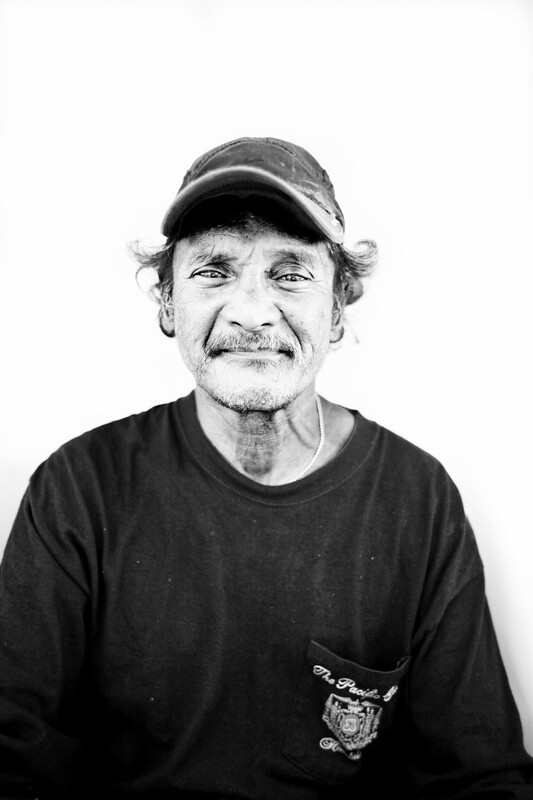 Darryl was also the person who revealed the reality of the homeless population in Hawai`i. He said, “there are two types of homeless around here… there are the ones who want to be homeless and live out in the open, and there are the ones who are psychologically not capable.” I questioned him about the families who were peppered along the fence lines in Kaka’ako. He explained that most of the families are eligible to go to the shelters, and were first in line to get a spot because they had children. My family and I later spent some time organizing weekend art workshops with the children at the shelter, in hopes of stimulating their creativity and encouraging self-expression. It was a really fun time for all of us. That summer was a profoundly startling experience in light of what I am facing today with my father. I was never afraid of approaching those who lived on the streets — no matter what condition they were in physically or mentally. Sure, there were times where I realized it was not in my best interest to disturb or approach them. I usually just wanted to give them the opportunity to be happy, to be treated like everyone else, and to give them some money for food. In my heart, there was always that nagging feeling that no matter what little I did or could do, it would always be like the saying, “You can give a man fish, or you can teach him how to fish.” I do not have all the answers, I really wish I did. But, what I do know is that my time with my father is real… it is honest, it is genuine, and it is a connection that I will have for the rest of my life. I may not be able to change him, or force him to do things he does not want to do, but I can sit there and tell him that I love him. I can continue to live my life in the best way I know how, that is to love and honor my beautiful sons, my incredibly supportive husband, and try to see the good in things everyday. This is a road that I have never been on before, but I like to think that people like Gerry and Darryl have helped prepare me to walk this part of my life journey. I know that there are others out there who are experiencing the same thing; Gerry’s daughter, Darryl’s nieces, and the loved ones of all those who live and sleep in the shadows of our streets.